Fira is on the left side of the crowded beach of Agali. Solitary, with pebbles and crystalline waters, can be of total relaxation. You can enjoy the sun till late, the sea and on the background the boats coming from Agali to Agios Nikolaos and Livadaki. There are two paths to take you to Fira. A short one, some 15 to 20 minutes walk starting from Agali; and a long one starting after Hora on the main road to Ano Meria, where the sighn to “Christos” is. It takes 25 minutes to the Church of Christos and another 15 minutes to the beach which is just underneath. 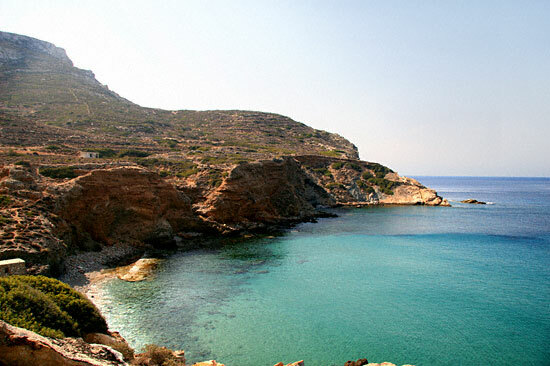 We could suggest another way to reach the beach, swimming to it from Agali!